This article consists of the instructions on how to correctly use the functionalities of HENNGE Secure Transfer User Console so that you are able to take advantage of all its features to the fullest extent. After reading this guide, you will be able to start using the features of HENNGE Secure Transfer User Console such as Sending Files, Receiving Files, Managing and Monitoring Sent Files. Step 2 - In the Secure Transfer user console interface, in "Send" -> "Send Files"
1) Choose the file that you want to send. Please note that you can upload up to 5 files and 2GB per transfer. 2) You can generate a random password for the file. This password will be required for the recipient to unlock the link to download the file. 3) Select the number of days for the file to be available in "Expiration" field. 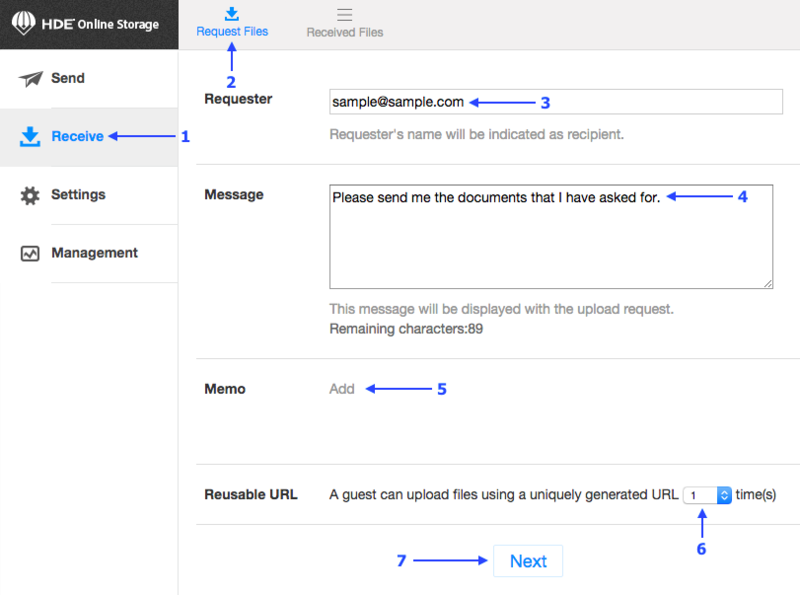 4) You could add a Memo to allow the recipient to have a brief idea about the file. 5) Click "Upload" to proceed. Step 3 - After the file is being uploaded, a few lines of texts will be generated as shown as below. You can copy the snippet and paste into your email for sending. Step 4 - Click on "Sent Files", you will be able to see the list of sent files. If you wish to stop anyone from downloading the uploaded file and ensure that the file is no longer available on the Secure Transfer, you can click on "Disable" as shown below. Click on the log to see the details such as the link, password, date of upload and expiration. Step 1 - In the Secure Transfer user console interface, in "Receive" -> "Request Files". 1) Enter your email in the "Requester" field as a requester. This will be shown to the recipient once they receive the request. 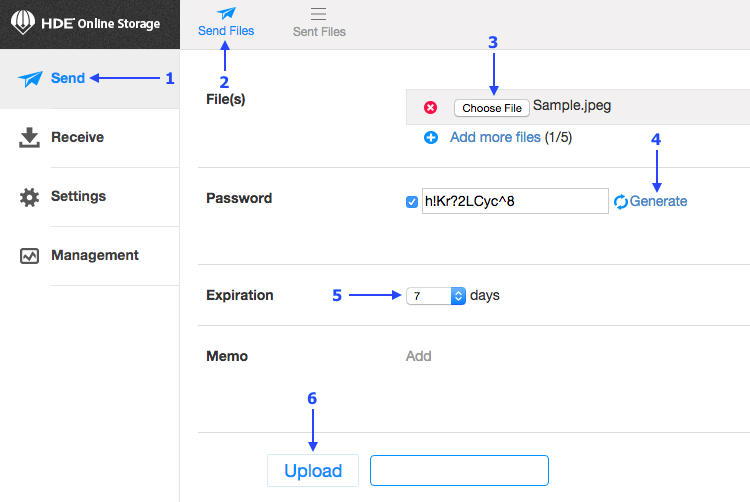 2) You can write a message and add a memo to give a brief idea about the file request. 3) Click "Next" to proceed. Step 2 - After the request is being generated, a few lines of texts will be generated as shown below. 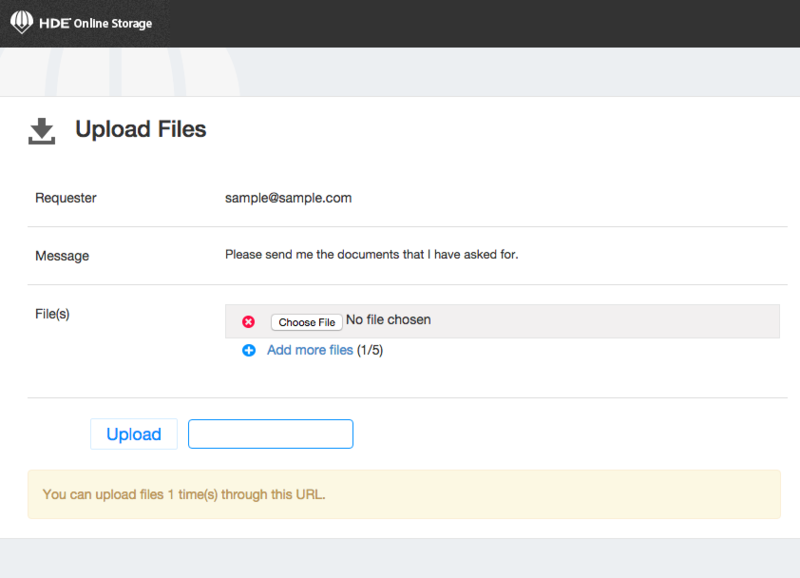 You can copy the snippet and paste into your email for sending the file request link. Step 3 - After you send out the email, the recipient should receive an email that looks similar to below. The recipient could then click on the link to access HENNGE Secure Transfer Upload page. Step 4 - The recipient will see an interface to upload the file requested. **Note: After the recipient has uploaded the files successfully, you will receive a notification email with the link for downloading the files. Step 5 - You can also download the file directly from the Secure Transfer user console by going to the "Received Files" menu. Click on the upload request log to expand for details, and click "Download". If you wish to share the file with other users in your organization, click on the icon on the right side of the log. 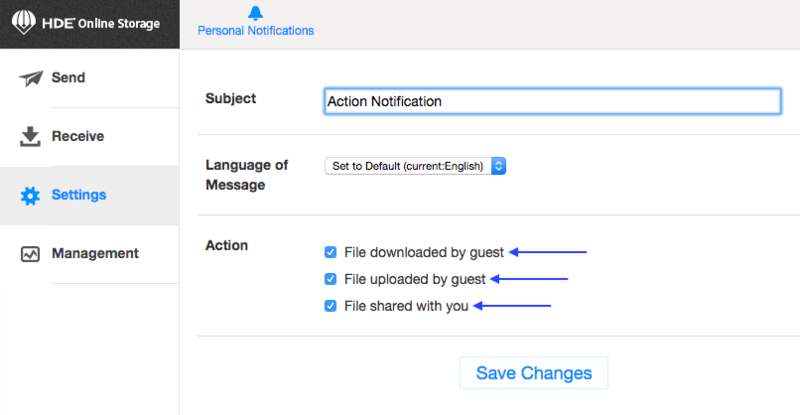 All users can enable the system to send a notification email to themselves to ensure that they are notified when specific actions are performed such as files being downloaded or uploaded. Go to "Settings" menu to customize the setting as shown below. The Access Logs can be found by clicking on the "Management" menu. Every time when someone accesses the files that you have uploaded to the HENNGE Secure Transfer, a log record will be generated and it can be found in the Access Logs. This is extremely useful to trace the access activities that are performed by authorized receivers.